You might want to make sure that your learners have a specific set of skills and knowledge before they take your course. 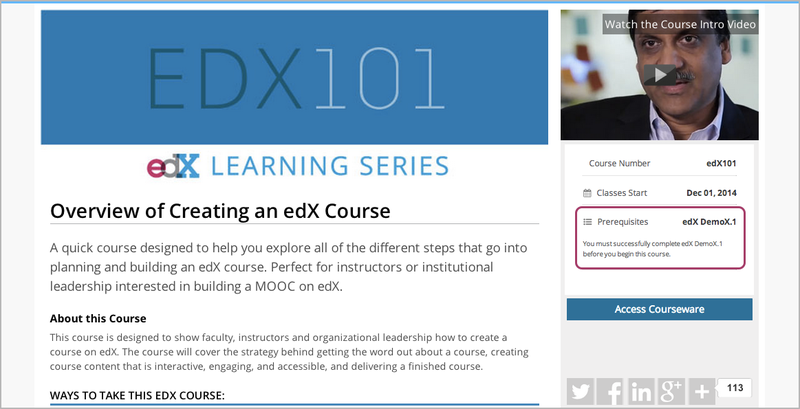 You can require that your learners pass a particular edX course before they enroll in your course. Learners see information about course prerequisites on the course About page. If learners have not completed the prerequisite course, they can enroll in your course and then see your course on their learner dashboards. 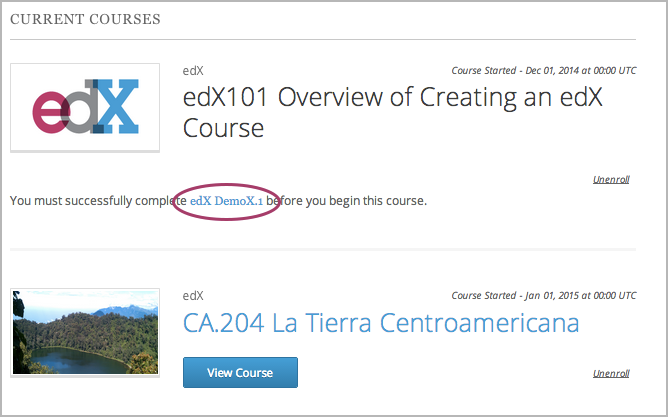 However, unlike with other courses, the dashboard does not provide a link to the course content. The dashboard includes a link to the About page for the prerequisite course. Learners can enroll in the prerequisite course from the About page. You can require your learners to pass an entrance exam before they access your course materials. If you include an entrance exam, learners who enroll in your course can only access the Entrance Exam page until they pass the exam. After learners pass the exam, they can access all released materials in your course. Select the Require students to pass an exam before accessing course materials check box. We strongly recommend that you follow several guidelines to help you and your learners have a positive experience with entrance exams. Make sure that your beta testers include the entrance exam when they test your other course content. Make sure that you mention the entrance exam in the course description on your course About page. Otherwise, learners will not know about the entrance exam before they enroll in your course and try to access course content. Add an announcement to the Course Updates & News page that contains information and instructions for learners who need to take the exam. When learners first try to access content in a course that has an entrance exam, they see the Course Updates & News page. We suggest that you include the following information. To begin the course entrance exam, learners select Entrance Exam. After learners complete the entrance exam, they must select Entrance Exam again or refresh the page in their browsers. When the page refreshes, learners can see all currently available course content. On the Instructor Dashboard, select Student Admin, and then locate the Entrance Exam Grade Adjustment section. The following options are available.